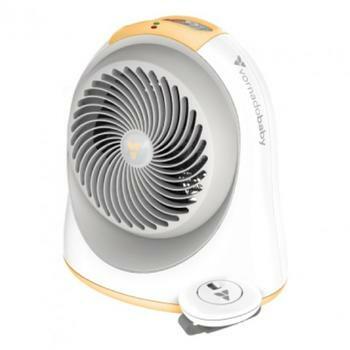 Vornado Air of Andover, Kan., is recalling about 5,100 Vornado Sunny CS nursery heaters sold in the U.S. and Canada. The company has received five reports of the electric heaters catching on fire. No injuries or property damage have been reported. This recall involves Vornado Sunny CS (cribside) model EH1-0090 electric space heaters sold in white with an accent of melon and gray colors. The heaters measure approximately 12 inches high, 8 inches deep and 11 inches at the base. The controls are mounted in a soft touch panel on the top of the unit with a multi-color display in the center of the control panel. “Vornadobaby” is printed on the side of the heater. The Vornado logo is printed on the front center of the unit. The model/type “SUNNY CS EH1-0090” and serial number are printed on a silver decal on the bottom of the unit under the elastic cord wrap. The recalled heaters have the numbers 1 and 7 as the fourth and fifth digits of the serial number (XXX17-XXXXXX). The heaters, manufactured in China, were sold at Bed Bath & Beyond, buybuy Baby and other stores nationwide and online at Amazon.com, Target.com, Vornado.com and other websites from October 2017, through December 2017, for about $100. Consumers may contact Vornado toll-free at 844-202-7978 from 8 a.m. to 5 p.m. (CT) Monday through Friday or online at www.vornado.com and click on Recalls in the lower right corner of the homepage for more information.